CGPSC Assistant Professor Recruitment 2019: The higher officials of Chhattisgarh Public Service Commission had released the notification to fill 1384 Assistant Professor Vacancies. Candidates who are interested in working as Assistant Professor in Chhattisgarh, they can look over this article. We had provided the complete details about CGPSC Assistant Professor Recruitment 2019 correctly and accurately. Aspirants who are excited in psc.cg.gov.in Openings 2019 can start applying from 4th February 2019 to 5th March 2019 through online. Higher Authorities of Chhattisgarh Public Service Commission had mentioned that the candidate who had completed their Post Graduation with the minimum percentage from any recognized university can only apply for these vacancies. From this article, applicants can get complete details about CGPSC Assistant Professor Recruitment 2019. We had noticed that a large number of competitors are searching various websites on the internet for CGPSC Assistant Professor Recruitment 2019 notification. For making their work easy, we had arranged this article. More details like Age Limit, Selection Process, Salary details and application Fee information are discussed in the following sections. The job location for the selected candidates will be across Chhattisgarh State. 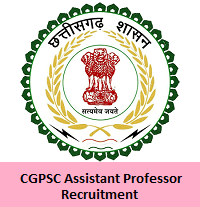 At last of this page, we had provided the official notification of CGPSC Assistant Professor Recruitment 2019. Candidate should possess at least 55% marks in the postgraduate degree level (or/ and grade 7 in the 7th-grade grading process) or any recognized university with a good academic record. After knowing about the educational qualification, every candidate must and should have to know about the age limit. The higher officials of Chhattisgarh Public Service Commission had mentioned the age limit as follows. In this section, we had given the complete details about the selection process that is done for CGPSC Assistant Professor Recruitment 2019. Selection is done in two steps. After understanding the salary details, Competitor must know details about the application fee. First of all, interested candidates must visit the official site of the Chhattisgarh Public Service Commission that is psc.cg.gov.in. Then go to the Notice Board section which is at top of the home page. In that, move to the Advertisements part. Now in Advertisements, search for CGPSC Assistant Professor Recruitment 2019 link. Click on it, then you will get the notification. Open and read it thoroughly. After understanding the notification, if you are eligible then fill the application form. Recheck all the details that you have provided. Here in this article, we had given complete information about CGPSC Assistant Professor Recruitment 2019 which is correct and accurate. For more updates regarding this CGPSC Assistant Professor Recruitment 2019 notification, candidates can also visit our official site Sarkari Recruitment. Aspirants can also get information about different state and central government jobs. We had also provided details about Admit Card, Syllabus, Results, and Previous Papers in our site. Competitors who are having queries about this article can leave us a comment in the below provided box.